Michelle Obama did not hold back when it came to defending her husband, Barack Obama's presidency during her book tour which took place in London. While the former first lady made sure she took her frustrations out, she also made sure that she did not name Donald Trump in the entire discussion she had about the country and its government. With a crowd of 15,000 that was gathered in O2 in London, Michelle pointed out that there was nothing wrong in the way her husband chose to run the country. "For anyone who had any problems with Barack Obama, let’s just think about what we were troubled by – there were never any indictments," she said, as reported by Independent. Michelle, who was being interviewed by Stephen Colbert, did not hesitate to compare the US to a teenager when Trump is the president. "We come from a broken family, we are a little unsettled," she said. "Sometimes you spend the weekend with divorced dad. That feels like fun but then you get sick. That is what America is going through. We are living with divorced dad." Michelle noted that prior to entering the White House, their life was completely different as they used to live like a "normal family". However, things changed pretty quickly for them and they did not have time to "adjust to the rarified air of politics". "We were always ourselves – the presidency does not change who you are, it reveals who you are," she said. "It is like swimming in the ocean with great waves. If you are not a great swimmer, you are not going to learn in the middle of a tidal wave. You are going to resort to your kicking and drowning and what you knew how to do in the pool." The 'Becoming' writer has not failed to mention Trump in her memoir. 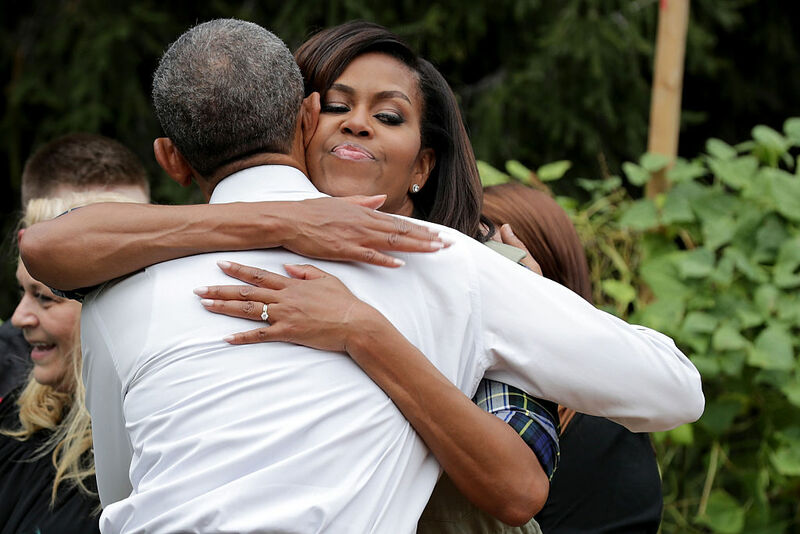 Michelle revealed that she has been finding hard to listen to the news which is constantly filled with negative news. "When I am not emotionally able to deal with it, I turn it off for a moment,” she said. "I only let some of that stuff into my world when I’m ready. You can’t have a steady diet of fear and frustration coming in." She even admitted that the world was in a "dark" place at the moment but there is still hope for things to get better in the future. "This may feel like a dark chapter but any story has its highs and lows but it continues. Yes, we are in a low but we have been lower. We have had tougher times, we have had more to fear. We have lived through slavery, the Holocaust and segregation," she said. "We have always come out at the other end – better and stronger. We are moving in the direction of diversity and inclusion. No-one ever said it would be easy. We are just in the throes of the uneasy path of change." Meanwhile, speaking about Trump's healthcare policy, Michelle admitted that her mind was taken back to the struggles the family had to face during their initial time at the White House. "I don’t know if there has been a president who has been accused of not being born in this country? Who has been asked to show his transcripts? Who has been accused of being unpatriotic? There was a lot of stuff that had not happened before that happened to us," she said. "There was a time when people accused me of not loving my country. They accused me of being loud and rude and obnoxious." She ended the discussion by reminding people that her husband was elected twice and how he was someone "who people thought was smart and would do the right thing."